Dileika Wilson never dreamed she would be selling wigs and “marvelous things” at her own boutique. And she never thought she would end up calling Salisbury home. If you stop into Timeless Wigs and Marvelous Things at 121 West Innes St., you’ll get a warm greeting from Wilson and Halo, her friendly Shih Tzu, who accompanies her to work and keeps customers company while they shop. Whether customers need a wig to help with self-confidence because of a medical issue, enjoy experimenting with different hairstyles, or just want to browse her assortment of reasonably priced accessories, Wilson is there with a smile and makes sure they’re happy when they walk out the door. When she and her mother, Marva, bought the downtown staple OK Wigs in 2016, the shop had been in Salisbury for more than 40 years. 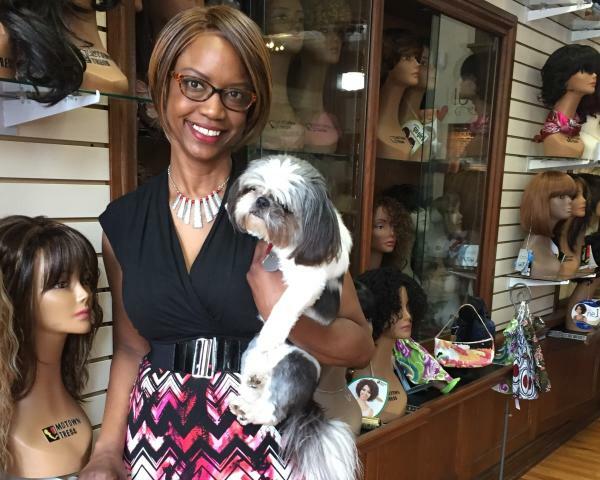 Wilson, who has a master’s degree in human resources and had worked as a business partner at a Fortune 500 company in Winston-Salem, began learning everything she could about the wig business. She already knew more than she ever thought she would know about wigs. After being diagnosed with breast cancer when she was in grad school, Wilson went through treatments that caused her to lose her hair. Although Marva Wilson is half owner of the shop, she lets her daughter run things. “I think, in her head, it’s all mine,” Dileika Wilson says with a laugh. They held their grand opening at the old OK Wigs location at the corner of West Innes and Main in April of 2016 and stayed there a year before moving to their current location beside the Salisbury Post – a more intimate, discreet space with a cozier atmosphere. After purchasing OK Wigs, they also bought a second wig business in China Grove and rolled it into what is currently Timeless Wigs and Marvelous Things. The shop carries wigs made from synthetic materials, human blends and even full human hair that can be colored, bleached and permed. Prices range from $50 to $1,500 or more. Even the less expensive wigs are not the ‘helmet head’ products of old, but instead are soft to the touch and look remarkably real. Part gift shop, part wig shop, part therapist’s office, party beauty shop, and even part petting zoo with the effervescent Halo always waiting for a friendly pat, Timeless Wigs and Marvelous Things already has exceeded Wilson’s expectations.